Ocala, FL - Despite high temperatures, thunderstorms, and hoards of bugs, nearly 70 volunteers helped sign a new designated route in Florida last weekend as part of a new initiative from the nonprofit Tread Lightly! called HUMMER’s Recreation Rescue. The project kicked-off with a volunteer workday on Saturday, June 21. Twice as many people arrived to volunteer than expected, and the volunteers installed all needed signs on 54 of the 81 miles of trail. “The volunteers were soaking wet much of the time, but they worked tirelessly and helped open up some trails at a time when many recreation sites are closing from lack of funding,” said Lori McCullough, Tread Lightly!’s executive director. The workday was also held in conjunction with a special “Wheelers for the Wounded” event, which strives to provide weekends of off-roading and camping to the country's wounded military members. The HUMMER X Club hosted that event, which happened on Saturday night and Sunday. “It's an honor to help out Tread Lightly! and HUMMER when called upon to do so,” said Jason Havlik, founder of Wheelers for the Wounded. Havlik is vacationing briefly in the US before he returns to Iraq later this year. 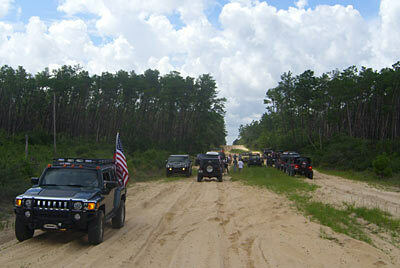 The Florida 4-Wheel Drive Association has volunteered to “adopt” the trail system and maintain it when work is completed. Without their adoption, and without the new funding from HUMMER, the new trail system would have remained closed. The Four Wheel Drive Way uses an existing system of roads – some have been maintained by the Roads Maintenance Program, and some are just forest roads that are not maintained. FL4WDA President Jason Kawaja agrees that providing a legal trail system for four-wheeling can help eliminate resource violations. “The designated four wheel drive route in the Ocala National Forest is a welcomed step forward to properly maintaining our natural resources while providing an outlet for off-road recreation,” said Kawaja. The stated purpose for the Four Wheel Drive Way is "to prevent resource damage, to encourage study and enjoyment of nature, highlight the importance of conservation, provide scenic and visual enjoyment, and instill appreciation of the nation’s history, cultural resources, and traditional values." HUMMER’s Recreation Rescue is a program promoting volunteerism and conservation for off-road recreation sites across the country. More information about Recreation Rescue can be found at www.treadlightly.org.